The ladies arrived at Wellingborough with some slight showers, however luckily it brightened up weather wise so the games could be enjoyed. Wellingborough golf course was presented beautifully, if the golf was not good for some ladies the flower beds lifted their spirits. The food & hospitality was second to none with the halfway house doing a roaring trade in Eccles cakes. 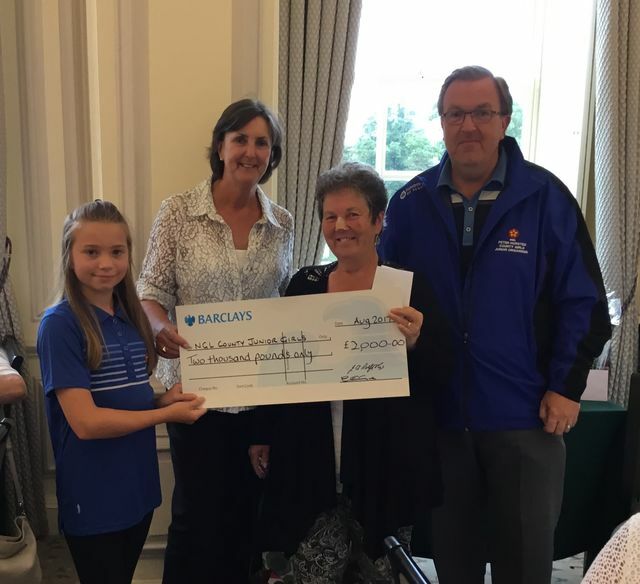 This event is the major contributor to NGL Ladies Past Captains fundraising efforts and with this in mind we were able to give £2000 to girls training in the county to Peter Horsted on the day. This was a team AMAM where each team had ladies from different clubs which added to the fun and camaraderie, other than all had to count on the 18 causing much anguish.